For beer lovers, there’s nothing better than a cold six-pack on a hot day. But what if you could do some good for planet Earth while slugging down your booze? 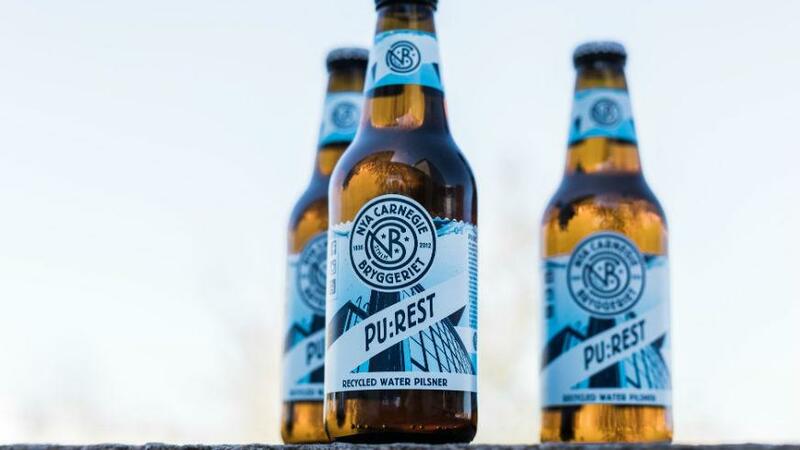 Swedish Brewery Nya Carnegiebryggeriet (New Carnegie Brewery), in collaboration with the IVL Swedish Environmental Research Institute and Carlsberg Sweden, crafted a new beer, PU:REST, made from reclaimed water. "In general, brewing water should be clean and free of any odors, such as chlorine or pond smells," reports Craft Beer & Brewing Magazine. This water usually comes in two forms: surface water (from lakes, rivers, etc.) and groundwater — and, naturally, it must be filtered. The site notes that, "good beer can be brewed with almost any water." But what about wastewater? IVL project manager Staffan Filipsson said, "The recycled water is as pure and safe as normal tap water, but most people are still skeptical about [actually] drinking purified wastewater." He hopes PU:REST will change that. Reclaimed water is wastewater that is treated for "beneficial purposes," states the United States Environmental Protection Agency (EPA). This recycled water could be used for agricultural and landscape irrigation, toilet flushing, artificial lakes, etc. Water recycling, reports the EPA, can help save resources and cut back on finances, and the agency notes that "no documented cases of human health problems due to contact with recycled water that has been treated to standards, criteria, and regulations have been reported." According to a news release, the H2O used in PU:REST comes from the water treatment facility Hammarby Sjöstadsverk and goes through a "long chain of purification steps." "The result," Chris Thurgeson, brewmaster at New Carnegie Brewery, said, "is a crystal clear pilsner, brewed on recycled water with organic malt and hops." Bottles of PU:REST contain 4.8 percent alcohol. "The main purpose of the project is to highlight sustainable water management and raise awareness of the global water issues and the value of clean water," Filipsson said in a statement. "In a world threatened by water shortage, we wanted to show that we already have technologies to recycle wastewater into drinking water that is as clean as normal tap water." PU:REST will be served at select festivals and restaurants around Sweden, and Metro has reached out to New Carnegie Brewery for information about potential U.S. shipments. Environmental efforts in the U.S.
Startup E6PR (short for "edible six-pack rings") has made headlines for its own environmental efforts. Teaming up with Saltwater Brewery in Delray Beach, Florida, they created biodegradable six-pack rings that are not a threat to ocean life. Instead of the plastic rings that pollute our waters, this eco-friendly alternative is made from "product waste and other compostable materials" that can be eaten by sea turtles, seals, etc. — and if they’re not consumed as a snack, the rings will biodegrade in a matter of weeks. They’ll be coming to South Florida grocery stores, sold around beer from Saltwater Brewery, within the next few weeks. Since you can’t pick up a pack of PU:REST in the U.S., consider purchasing beer with E6PR to support the environment — because where’s the harm in cracking open booze that also does good?